The plans for these clocks came from Norm Abram’s book “Mostly Shaker.” I also watched a YouTube video from The New Yankee Workshop episode in which he built the clock. One is made from red oak, the other made of walnut. I followed the plans precisely, but made one small change. I make the doors using a offset mortise and tenon Norm outlines in his program, but was not happy with the results. I remade the doors using simple half-lap joints. The clock face was printed on cardstock from an online graphic. 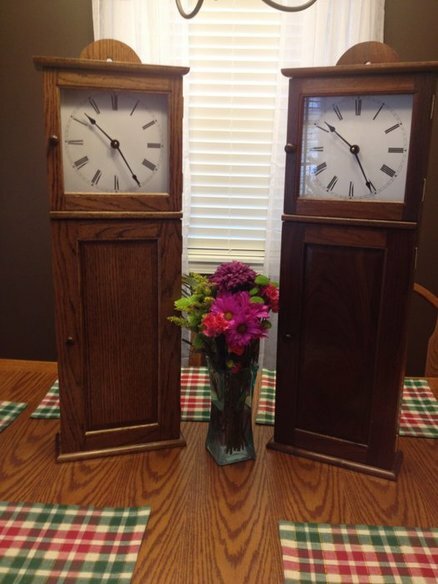 The clock mechanics were purchased from Hobby Lobby, and the glass and hinges came from Lowe’s. Construction and finishing time for the two was about 20 hours, as it required a bit of planing. The walnut clock was finished with six coats of Danish Oil. The oak clock was stain and three coats of polyurethane. The walnut clock was a gift to my boss and his wife. His dad, Poppa Smith, had passed away earlier in the year and Buddy gave me the walnut his dad had in his small woodworking shop. Be the first to comment on "Shaker Wall Clock"